The nest is part of our main residence and is our newest offering with one bedroom and an open plan living area and a large window overlooking the garden and Thai Cushion area. The second sleeping area is situated on a charming Mezzanine which overlooks the living area. A characterful open space with stone walls, exposed beams and a full kitchen with oven, fridge, microwave, kettle, toaster and dishwasher. 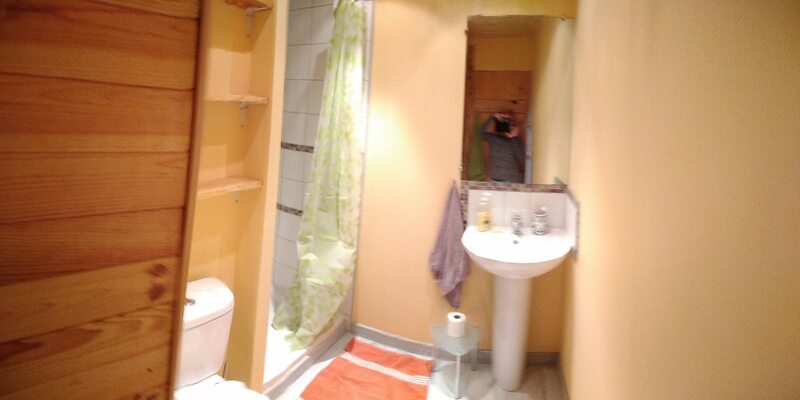 This apartment has a bathroom with shower and toilet and a separate toilet. We rent this apartment for a minimum of 2 nights. Two sofas reside in a cosy living space with DVD player. Available with 2 x single beds or 1 x double bed with wardrobe. Contains 2 x single beds and storage space. Guard rail and attractive carved tree trunk stairs with hand rail. As this apartment is part of our main residence it may be occupied by friends and family from time to time but do enquire!